A pizza party is such good fun. 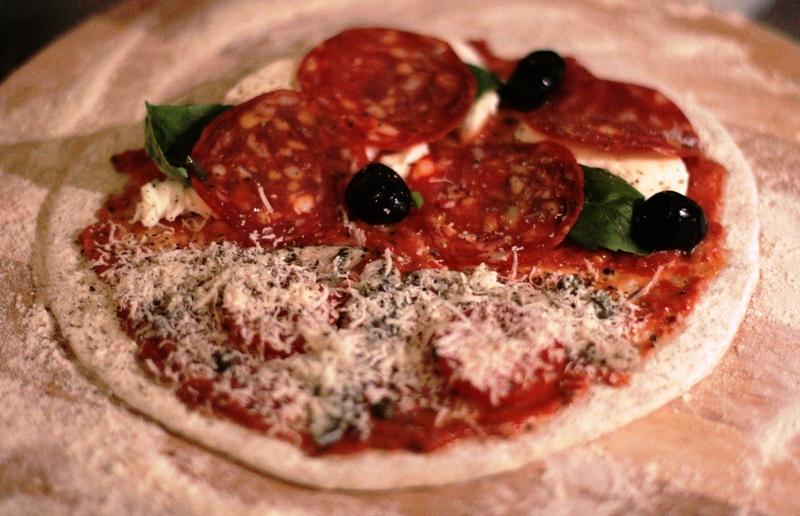 You just pre-make some pizza dough, lay out a variety of toppings and let everyone make their own perfect pizza before baking them in the oven for 10 minutes or so. 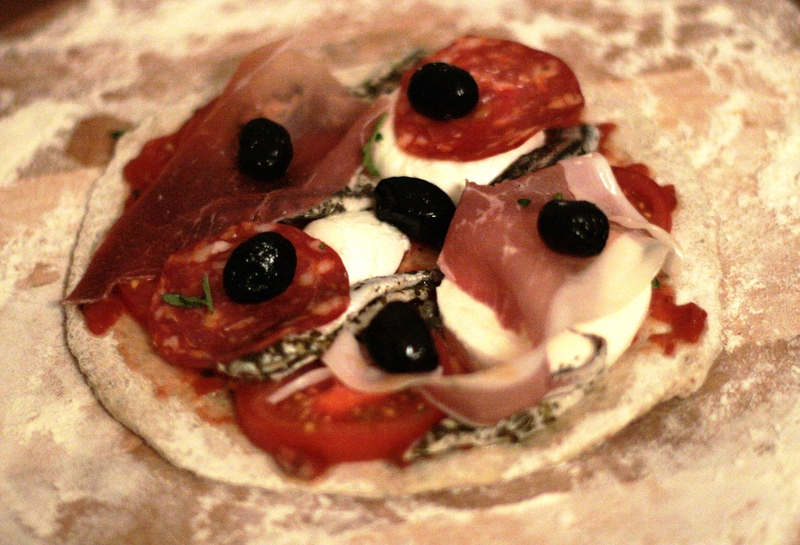 I used the pizza dough that they use in the River Cafe and it worked really well. Rose and Ruth (of The River Cafe) claim that this dough recipe works well in a cold climate (like England of course). In a large warmed bowl, mix the yeast with the warm water. When “melted”, add rye flour and stir well. Leave in a warm place to form a loose dough (or as Rose & Ruth call it, a sponge), for at least 30 minutes. It is important to cover the bowl while the yeast starts to work to make sure there aren’t any cold draughts. Add remaining ingredients and mix together (you can use a food processor with a dough hook or a hand whisk with a dough hook if you have them!). Place on a floured board and knead with your hands, using quick, light motions. Add more flour to the board to stop the dough sticking. Knead for 10-15 minutes until the dough is elastic and silky. Put in a bowl greased with olive oil, and drizzle a little over the top (this will prevent a crust forming). Cover with a cloth and leave to rise in a warm place for two hours (or until it has risen to twice its size). remove from the bowl and knock the dough back, and then knead a couple more times. Return to bowl and allow to rise for 40 minutes. When dough is ready, divide and form into 6-8 small balls and wrap in clingfilm until your guests arrive. 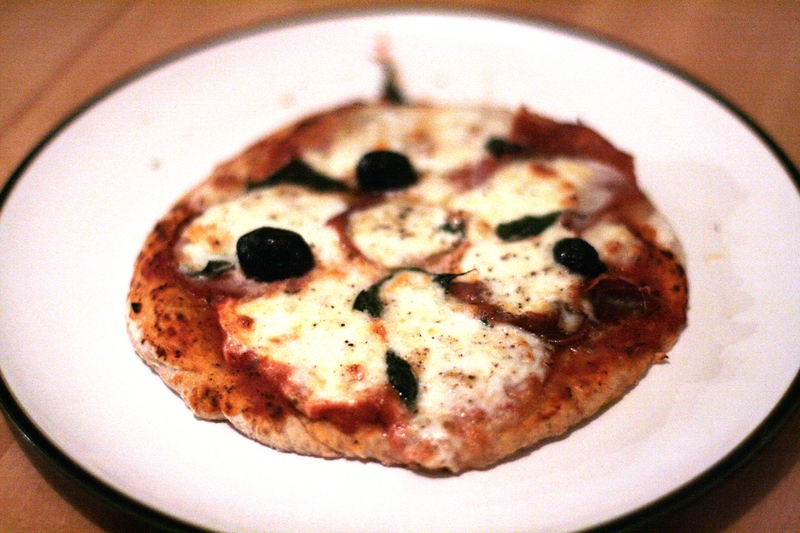 The secret to really good pizza in a normal domestic oven is having a pizza stone on which to cook the pizzas, as it gives you a really good stone-baked effect. I simply went down to my local tile merchant and asked for a piece of thick marble (you want it to be 2cm thick ideally) to fit my oven (40x40cm), took it home, cleaned it up then placed it on the bottom shelf of my oven. It cost me a fiver! Marble and granite work the best I believe, but you can also buy actual “pizza stones” which are ceramic, more expensive and less effective! Whatever you choose, get it in the oven and preheat your oven to the absolute maximum temperature. I made a whole bunch of bruschetta and antipasti (including fried calamari – yum) to keep everyone’s appetites at bay whilst we made our pizzas and then let eveyone get down to it. I laid out a variety of toppings to suit all: anchovies, capers, olives, pepperoni, chorizo, prosciutto, basil, gorgonzola, mozzarella, cheddar, parmesan, chillies, tomatoes and rocket. Stevie Revs volunteered to go first and unfortunately bore the brunt of the steep learning curve as a result. 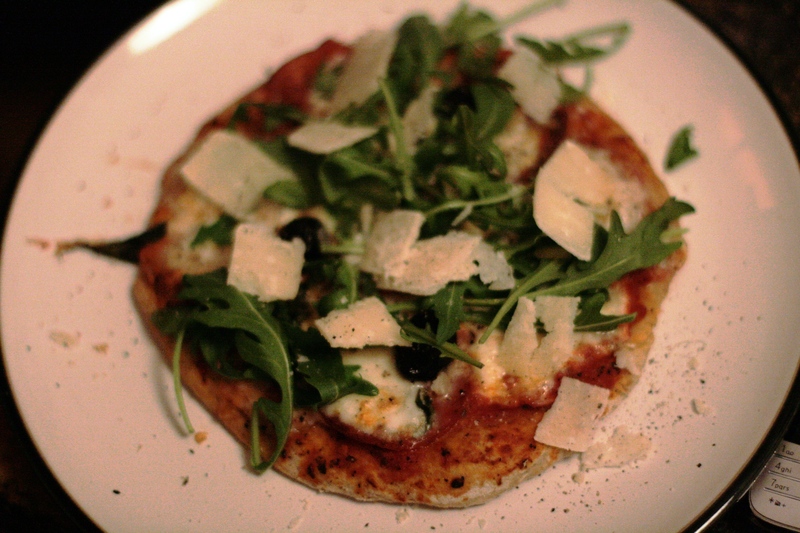 He went (on my advice) for a very thin base on the basis that the thinner the pizza base the better (which I stick by). 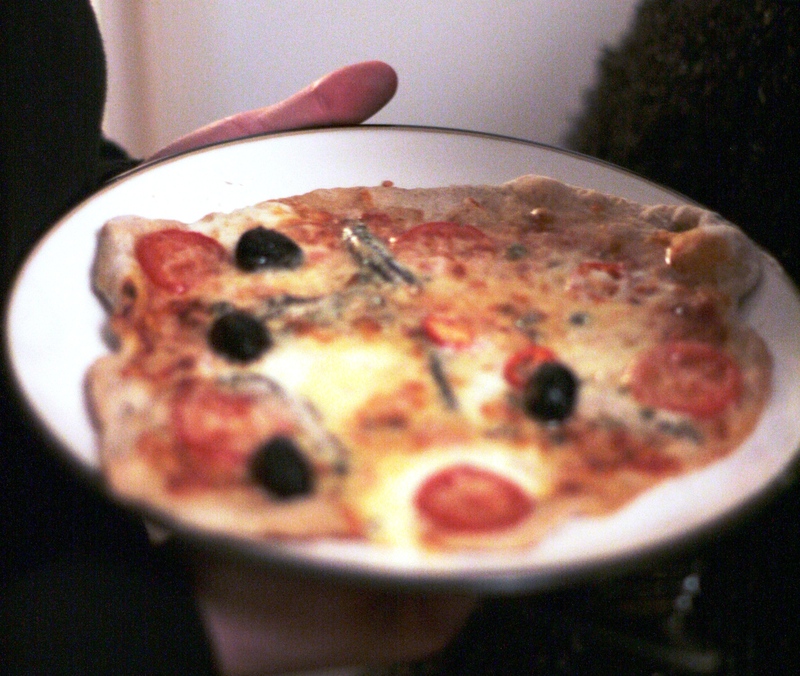 However, he did not put enough flour underneath the pizza as he was adding the toppings and consequently it kinda stuck to the board and was very difficult to transfer to the oven. So, although his looked very good going in, it looked like a bit of a mess (a hot mess, granted) coming out! 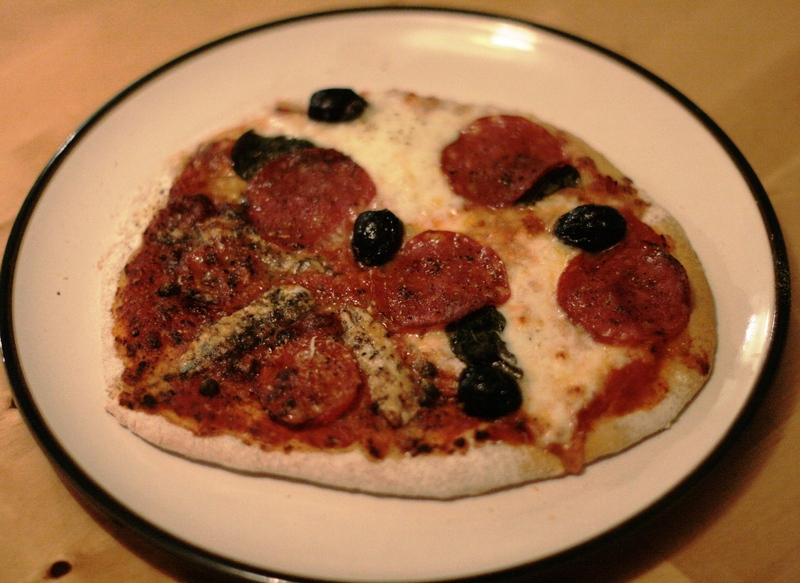 He was brave with the toppings too: anchovies, pepperoni, mozzarella, olives, cheddar, and very hot chillies. He was on fire for the rest of the night! For subsequent attempts we mostly kept the pizzas a little bit thicker and used loads of flour underneath them so that they were easier to get into the oven. They were still pretty thin though and still tasted really good (and very authentic). If you have a broad spatula with which to shimmy the pizzas into the oven then you might be able to keep them really thin! 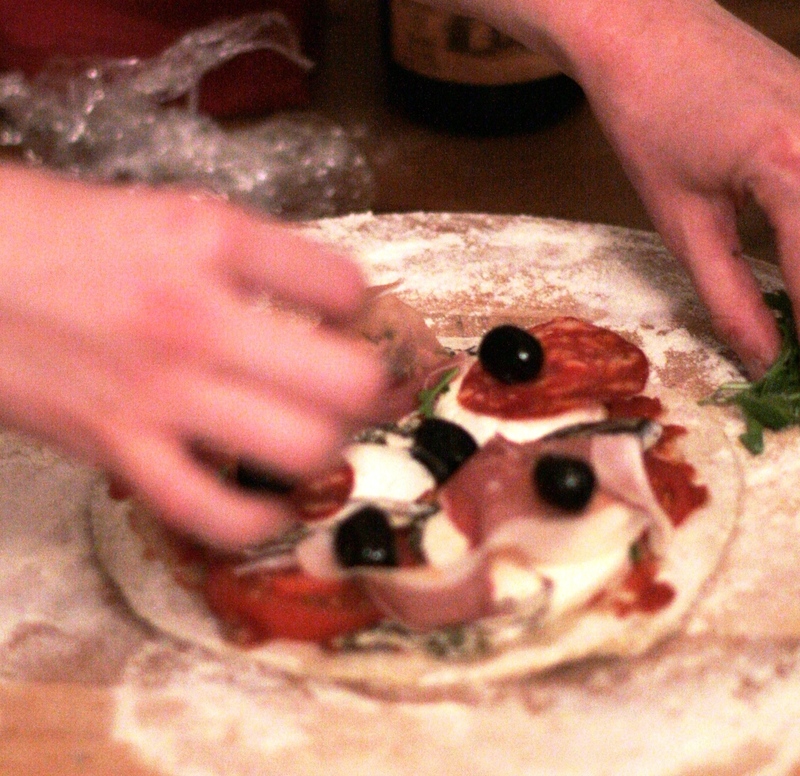 Kim is not a cook and fretted terribly about how to go about putting her pizza together. And then she produced the below! It looked bloody good, so good on coming out of the oven that I forgot to take a photo and instead just gaped in jealousy whilst she ate it. Lou is obviously creative. Hers looked as pretty as a picture going in and the finished product was extremely appetizing. She scattered rocket and parmesan on top after it came out of the oven and it looked delicious. Duncan was adamant that his pizza was going to be the best. He went for a half and half and whilst it looked quite good going in, he made the schoolboy error of just having parmesan cheese on one side. 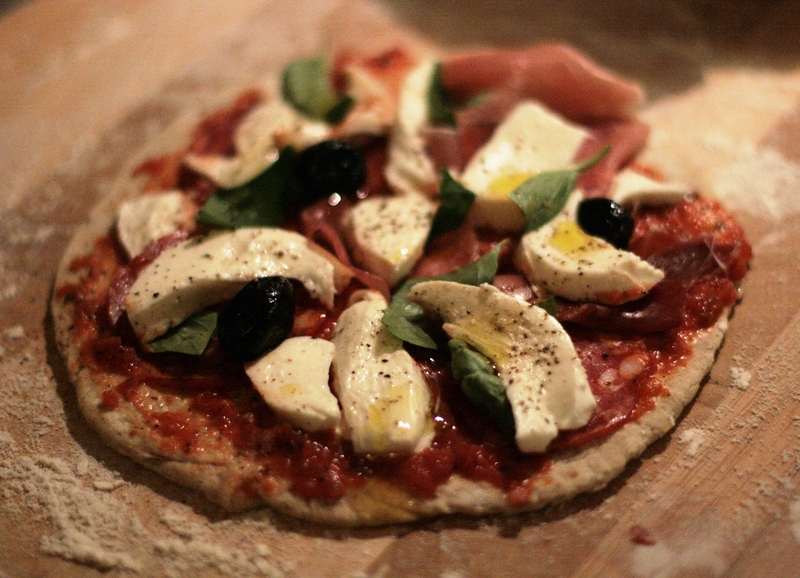 Pizza needs mozzarella! So, he was disappointed with the anchovy and parmasan side. But the other side looked and tasted stellar. Sven was all about the prep time. He really thought about his flavours and about what he likes and although it don’t look like much, he asserts that this is one of the best pizzas he’s ever had. He too went half and half, and despite my protestations that thin pizzas were difficult to transfer to the oven, he insisted on going super thin. 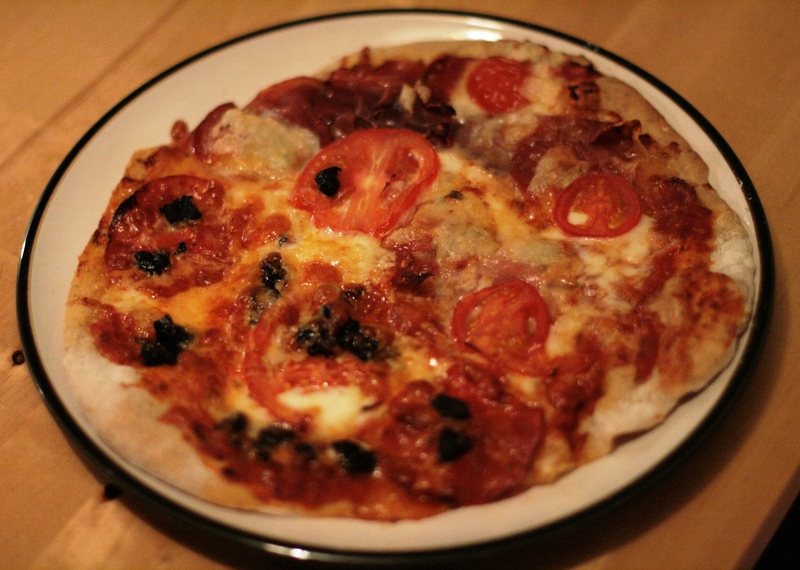 In terms of toppings, one half had gorgonzola, proscuitto, pepperoni, cheddar and mozzarella. 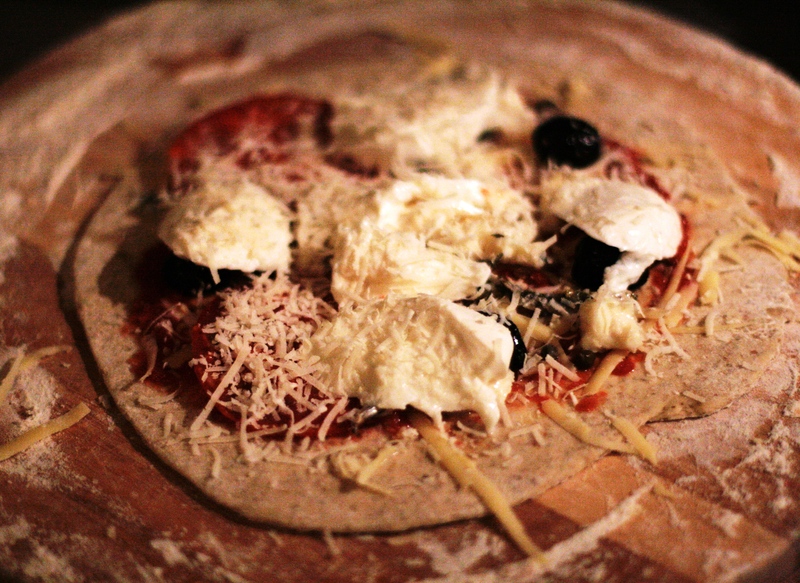 The other half consisted of mozzarella, cheddar, olives, chorizo, tomatoes. I have to say, he wasn’t wrong: it was really really good! I went back to basics for mine. 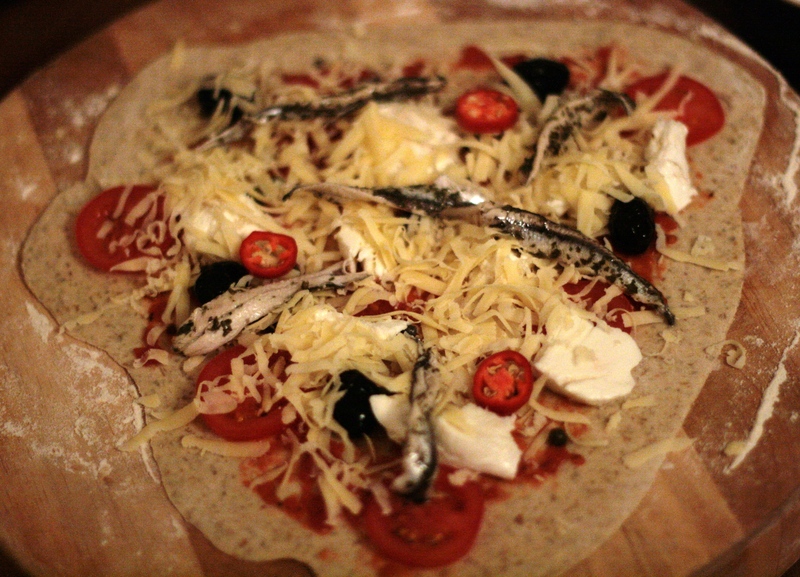 Anchovies, capers, olives, mozzarella, and cheddar went into the oven. 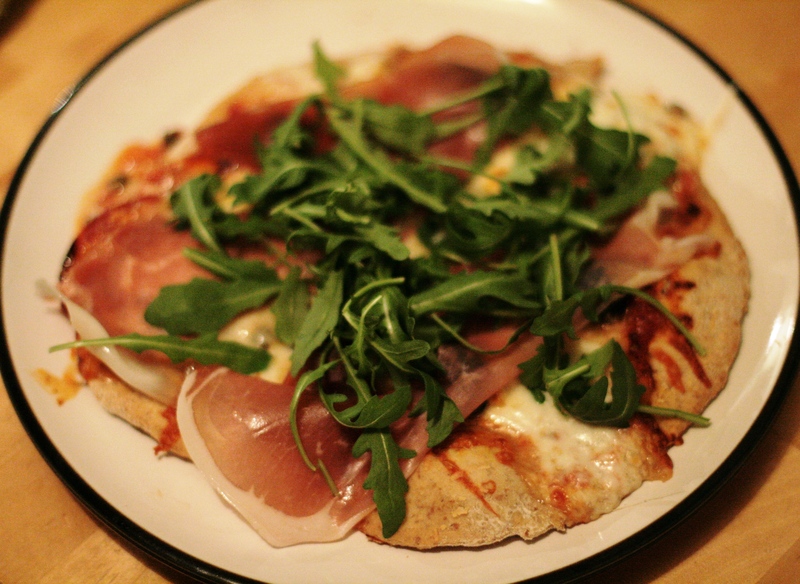 Then prosciutto and rocket were added at the end. 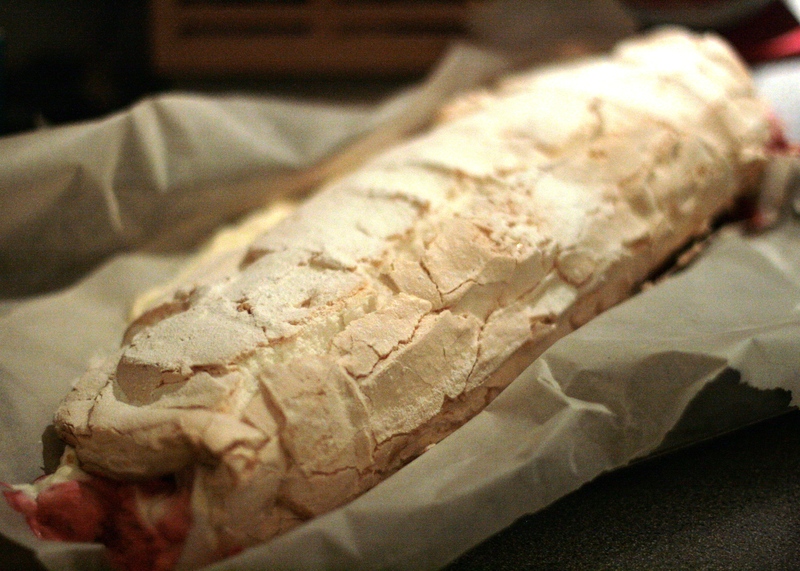 When the pizzas were polished off we tucked in to my signature dessert, raspberry meringue roulade, which I’ll tell you about another day (but is damned good!). So all in all, I think our pizza party was an absolute triumph. It was really fun to do something different and I think everyone enjoyed getting involved. Each person seemed to take pride in putting together their pizza and therefore felt real ownership over their dinner, which I think is nicer than just being served food (no matter how good it is). A pizza party is the ultimate “snacktivity”. It’s a messy business, I’m not gonna lie; but it’s also loads of fun! It would be a really great thing to do at a children’s party, but if you’re short a few kids then it will equally entertain a bunch of your grown-up friends. It certainly did mine!